InboxPays is one of many get-paid-to (GPT) websites, and if you are interested in signing up, the following InboxPays review will touch on all you should know about the company. We’ll discuss how it works, whether or not it is a scam or real, and also look at its rewards process. Beyond discussing the layouts of the company, this InboxPays review will also discuss the common concerns among users. These include issues with the high cash-out rate and questions about how the company handles your private information. InboxPays is among the many GPT websites out today and if you are looking for something similar, you can check out Swagbucks, InboxDollars, or Survey Junkie. When it comes to InboxPays, they pay you to perform a number of different tasks. While it doesn’t have the most visually appealing website, InboxPays is simple enough for anyone to use. Is InboxPays Legit or a Scam? As we were writing this InboxPays review, we learned that this website tends to lean more towards being a scam. Now, you do not have to pay to signup, which is always a plus, and some have mentioned receiving some money from the company. However, that may be the only positive thing about it. There are some glaring issues about the company that must be talked about in this InboxPays review. The high cash-out rate is a concern among many users, while others complain about the time it takes to earn enough money to reach that limit. Also, some have mentioned not receiving anything at all even though they have met the minimal requirements and even had their phones verified as per request. Daily Surveys: You can take whatever surveys are available that day to earn some cash. Most of them are usually worth around $1 or so. Cash Emails: You will receive messages on a daily basis, a maximum of three, and you will earn cash for clicking on these emails. This is generally worth about 25 cents per click. Using this tactic can result in spam, so it may be best to use a secondary email address for this. Cash Offers: You get to choose from a variety of offers, each valuated at a different amount. Some are worth up to $75, but you may have to pay for a trial or something similar when it comes to such offers. Referrals: If you invite friends to join, you can earn 10% of their offer earnings once that friend submits a payment request. Spin to Win: On InboxPays, you can get paid to play games (such as spinning) to win the jackpot prize. Coupons: You can save money by clipping available coupons and using them the next time you shop. InboxPays only has one reward, and that is cash. Everything that you do on the website, whether it’s reading emails or completing offers, will result in your getting money for it. The rewards for an action can be as little as a few cents to as much as over $60. However, you can only request a payout through PayPal, and only once you have $50 or more in your account. Payments are then made in multiples of $50, so if you have $51 in your account, you will only receive $50. That $1 will remain in your account. There are other stipulations attached to cashing out. You must have a minimum of $25 from Spin Wheel or offers. In addition, there is a max sum of $25 in Cash Email credits allowed per payment request. Payments are only made on the 1st or 15th of each month. These will also get done only after the mandatory 30-day waiting period. This waiting period starts ONLY if your phone is verified. If all these rules seem outrageous to you, rest assured, you’re not the only one – a great number of users have voiced similar concerns. There are several positive aspects to consider as you’re thinking about signing up with InboxPays. However, there are still some obvious drawbacks when it comes to being a member of the website too. Many of these came about as we were browsing reader opinions while writing this InboxPays review. Different ways to earn: There is more than one way of earning cash from InboxPays. If you are not making much one way, you can always turn to another. 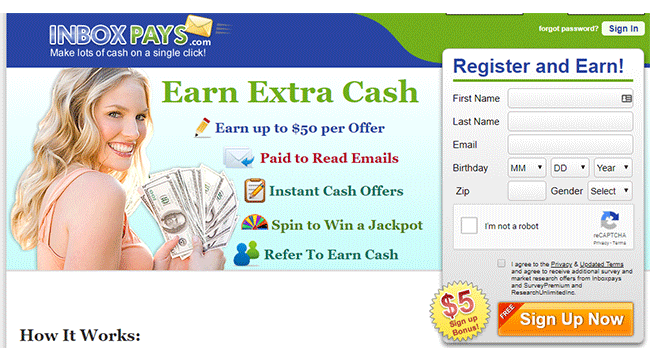 Cash payout: Unlike other similar websites, InboxPays deals directly and exclusively with cash. Many people who are looking to have some extra pocket money may consider this the most appealing feature. Payout rate: Many consider it difficult to cash out on InboxPays because of the $50 minimum that you must meet before requesting a payout. This is complicated by the fact that many offers are usually worth only a few cents or a couple of dollars. It might take a while time before you can earn enough to withdraw. Even then, you have to wait 30 days in addition to only being able to withdraw on 2 specific days of the month. Many users are concerned about the high cash-out and still many more point out how difficult it is to earn enough money to request a payout in the first place. There is no real fix to this issue other than trying to complete more offers and a larger variety of tasks in order to earn cash faster. Besides these issues, there are also some questions about the user’s privacy while on this website. Although the company claims that your information is protected and that it won’t be sold, their partners do receive some of your details. Those partners have their own, different privacy policies, so they can spam your email. The easiest way to fix this is to read over each email and see how you can unsubscribe. Support Ticket: If you are having technical issues, you can easily submit a Support Ticket on their website. Mail: You can write to the company at Inboxpays, 14781 Memorial Dr., STE 3397, Houston, TX 77079. Social Media: If you want another way to contact the company or are looking to get in touch with community members, you can try on Twitter or Facebook. To conclude this InboxPays review, it is easy to see why so many question the legitimacy of this company. Some users have received their cash, but there are too many complaints that cannot be ignored. As there are many other similar and better GPT websites, InboxPays is not the one to recommend.